Oil on Canvas, 16" x 14"
"Looking South Across the Michigan Avenue Bridge"
"Standing Figure with Children Resting"
Oil on Canvas, 36" x 44"
NEW! 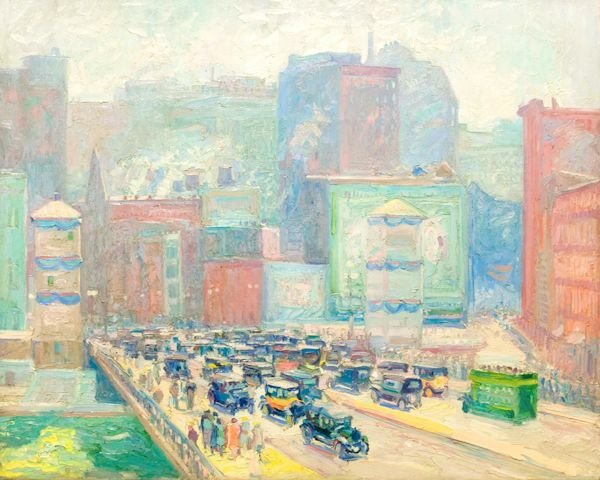 "Krehbiel - Life & Works of an American Artist" posted online! Check the "Artwork" exhibits for even more examples of Krehbiel's fine art! Quality reproductions of Krehbiel paintings coming soon. Check back! "If someone could splash a rainbow and catch the shower of colors on canvas, that was Krehbiel." 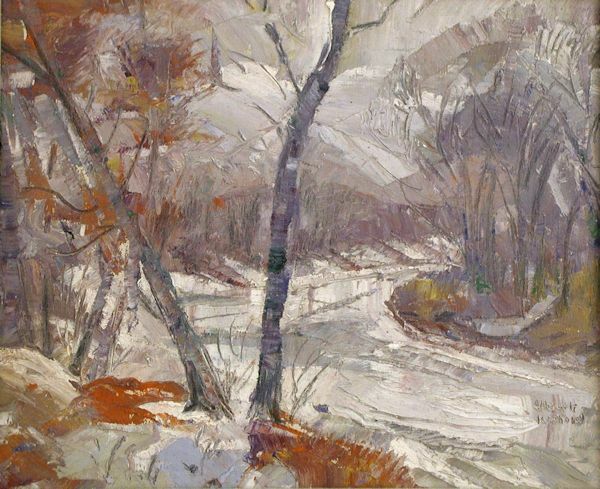 "He is best known... as the poet-painter of winter, for he liked to paint scenes along the Des Plaines River when the snow was falling and mingled with his colors." 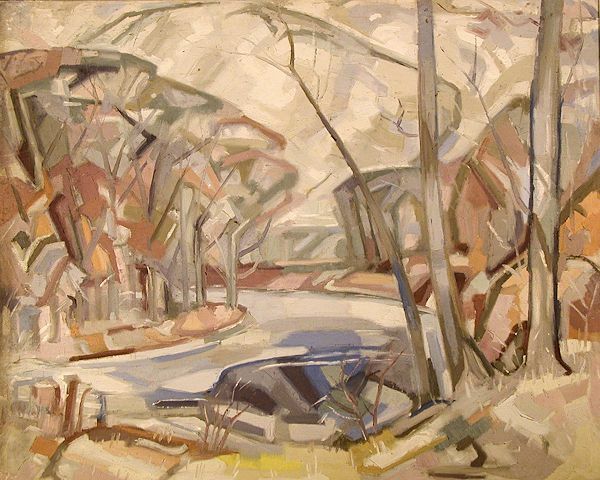 Characteristic of the Krehbiel landscapes is the feeling of peace and solitude imparted by his subtle blending of pastel shades in depicting the play of lights and shadows among the trees and in the icy rivers he loved to paint on location in even the worst of winter's snowy weather. Albert Krehbiel was unanimously awarded the commission to design and paint the wall and ceiling murals for the Illinois Supreme and Appellate Courts, Springfield, Illinois, 1907. Above is a historical photo showing Krehbiel painting the murals in his studio. The son of a blacksmith and buggy maker, Albert grew up in Newton, Kansas. His artistic talent was discovered by the director of the Art Institute of Chicago, William Merchant R. French, during one of his lecture tours and he encouraged Albert to enroll at the Art Institute. Within a few years of enrolling, Krehbiel was awarded a traveling scholarship which enabled him to study abroad under the greatest of the European artists, including Jean Paul Laurens at the L’Academie Julian in Paris. In Paris, Krehbiel received honors seldom bestowed on Americans. 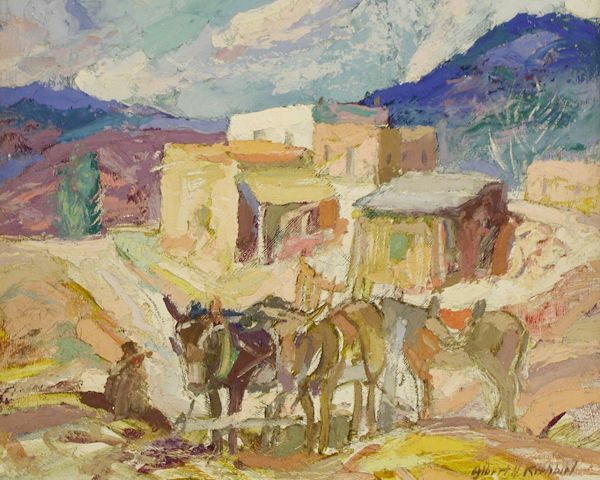 In spite of his success in Europe, he returned to the United States in 1906 with four gold medals, the coveted Prix de Rome, and exposure to the impressionists’ plein air landscapes. Upon his return he married fellow artist and classmate from the Art Institute, Dulah Marie Evans, and was offered a full-time faculty position at the Institute. In 1907 he was awarded a commission to paint the murals for the Supreme Court building in Illinois, selected over 22 other acclaimed artists. It took Albert and Dulah four years to complete the historical and allegorical works. These were the last works Krehbiel completed in the traditional style of his academic training, opting instead for plein air landscapes, painting from life. 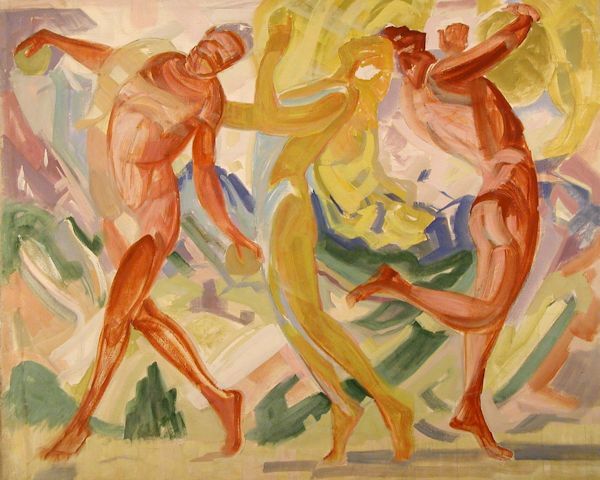 Please contact us for more information regarding Albert H. Krehbiel's life or paintings. Additional info and publications are also on the Dealers & Books page.